The Gift Insider is happy to help journalists and bloggers with pieces on the art of giving gifts. For your convenience, we have provided hi-res print-quality photos available for download below (all photos should be credited “Courtesy of TheGiftInsider.com”). You can also download our latest press releases. And, if you need a quick quote to add to your mention of The Gift Insider, see our “Insider Quotes” section below (making sure to attribute all quotes to “Lindsay Roberts, gift-giving expert and founder of TheGiftInsider.com”). For interviews with Gift Insider founder Lindsay Roberts, and all other press inquiries, feel free to contact us directly using the Contact link above. TheGiftInsider.com Recommends Heartfelt and Creative Ideas for Mother's Day. Romantic, Unique and Creative Gifts for Valentine's Day. New Site to Help Shoppers Find Unique Gift Ideas. 1. Make it Personal - So many gifts you order online can be engraved, embroidered and customized for a few extra bucks. It shows you put some thought and effort into finding a gift just for that person. Order early. 2. Consider Handmade - Etsy.com is our go-to for handmade gift ideas. It's brimming with meaningful and affordable finds that are sure to be as unique as the artists who make them. Festivals and fairs are another great place to find one-of-a-kind items. 3. Go for a Memorable Experience Gift Many companies now offer gift certificates where recipients can pick from hundreds of unique experiences like driving a race car or being a fighter pilot for the day. It's a perfect way to give them something they've always dreamed of. 4. Don't forget the WOW factor Try to add special touches to every gift you give this year. Combine a few similar and smaller items into a pretty gift set, add in some easy photo gifts from Walgreens, or wrap the gift using a favorite flower instead of a bow. Listen closely to the people in your life. Many people unintentionally mention things they really want or need or some may drop subtle hints at what they are really hoping for. Don't give something you know YOU would like, give something you know THEY would like. Think about their hobbies. There are hundreds of gifts out there associated with even the most obscure hobbies and tastes. If you find a few smaller items, put them together in a themed gift set - everyone likes to get lots of presents. A gift is something that is supposed to make someone feel appreciated and loved. Put extra thought into it and don't take the easy way out. Take note of their gift giving style. Do they always write thoughtful cards, or are they the ones spending weeks putting a scrapbook together? Do they always plan special surprises for you? They would probably appreciate similar sentiments as they are giving. It's okay to re-gift under certain circumstances, but you have to be careful. Never give something that isn't in the packaging it came in. Never re-gift something that was handmade for you. Never re-gift something that is banged up, dated or sitting in your closet for years, and most importantly make sure that the person you are giving it to is far removed from the person who gave it to you. Weddings - do you buy your gift off the registry or not? I always support trying to do something a little more unique if it is someone special to you. Here are some creative gift ideas for weddings. Creative Gift Ideas for Friend's Birthdays - read this article for the best things to make them, the best places to take them and best ways to surprise them. The person who has everything? You can never get enough Experience gifts. Someone who keeps saying they don't want anything - bake them something or bring them fresh flowers from the flowers market. Guy struggling to find a gift for your girlfriend? Check out our What Women Want Section or ask their girlfriends or mothers, but please, please don't guess. What do you do if you have been dating a girl for only a few months and want to do or give her something that shows care without overdoing it? Pamper her with certificate to a mani/pedi, bring over her fav wine, fav candy and fav DVD, take her out and surprise her with dinner at a place she's been dying to go to or take her to a comedy show. What do you do if you start casually dating a girl right before Valentine's Day, her birthday or Christmas/Hanukkah? Do something thoughtful but small - a card, a little stuff animal, some flowers (too soon for roses - try gerber daisies), make her a dinner - don't overdo it here, she won't be expecting much but she will definitely be expecting something. Want to give a special gift from your favorite city? Find Unique and Handmade Gift Ideas. Handmade artisans set up online shops from all over the world on Etsy. Use their local search feature to find handmade items only from local artists. Take advantage of summer's many art fairs and festivals, which are full of one-of-kind finds. 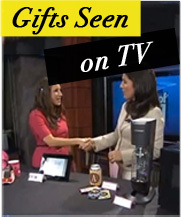 Looking for gifts for friends or clients visiting your area? Make them a care package full of city themed goodies - specialty food from the area, gift certificate to an infamous restaurant, passes to your most loved museums and a city guide book tabbed with some personal recommendations of your own. Put it all together in an eco-friendly shopping tote that they can use during their excursions. More tips and etiquette to come!